Félix Tournachon, a.k.a. Nadar was a French balloonist, photographer, draftsman and writer, born in Paris (1820-1910 AD). 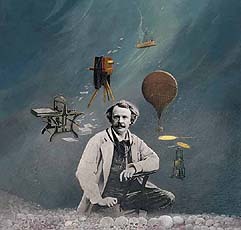 He took pictures of most of the famous people of his time, including Jules Verne, and shot the first photographs ever taken from an airborne platform (1858 AD).